The AMX-40 is a rank VI French medium tank with a battle rating of 9.7 (AB/RB/SB). It was introduced in Update 1.79 "Project X". 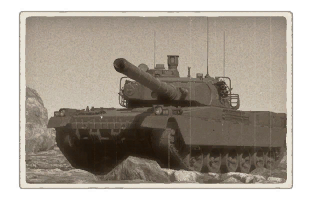 The AMX 40 represents a massive shift in the French tank tree, with the addition of a stabilizer, whereas all other vehicles, with the exception of the American vehicles (Sherman M4A1, Jumbo.) have no actual stabilizer. Many players might find themselves hesitating to fire a shot as soon as a target is seen because there is usually time to think before the gun is stabilized, but at this rank, French players might find themselves having a hard time shooting before their enemy. Ammo racks of the AMX-40. Development of the AMX-40 began as a private venture of the French GIAT company in the early 1980s, with the aim to create a new export vehicle, in anticipation of an increased demand for military equipment from middle eastern countries. GIAT engineers decided to base the new vehicle off the AMX-32, which itself was an improved export version of the successful AMX-30 main battle tank. However, compared to his predecessors, the AMX-40 was to feature vastly improved firepower, mobility and protection. 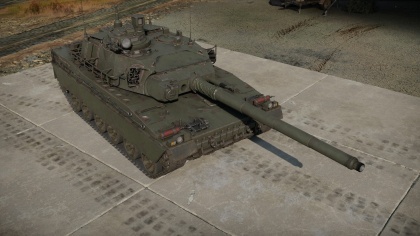 As a true first in the French postwar tank development history, the AMX-40 would receive a two-plane stabilizer for its 120mm smoothbore cannon. Although the tank’s turret and cannon were mostly adopted from the AMX-32, increases in weight from new components led to the fact that the hull of the vehicle had to be redesigned from scratch. The work on the first prototype was nearing completion in 1983 and the vehicle was first shown off at the Eurosatory exhibition in the same year. Following testing in 1984, two further prototypes were constructed, featuring a number of improvements over the first one. By now, the French Ministry of Defense had started to back the promising project and GIAT soon afterwards transferred all three prototypes for comprehensive troop assessments. A final, fourth prototype was constructed in 1985. Each prototype was unique, featuring a number of external and internal differences with the main one usually concerning powerplant options. In the late 1980s, the vehicle’s development stagnated as active development was largely replaced with an active marketing campaign, in an effort to find a potential buyer for the new vehicle. Despite France’s best efforts to market the vehicle, even going as far as showing off some of the prototypes in a competition in summer of 1986 in Saudi Arabia, a buyer couldn’t be found. Spain was the only country showing some interest in potentially buying the AMX-40, but in the end, nothing came out of it either. By failing to find a buyer, domestic interest in the AMX-40 also faded and eventually resulted in the project being closed in 1990. Ultimately, the four constructed prototypes of the AMX-40 can only be considered as transitional designs, bridging the gap between the old second generation French MBTs, like the AMX-30 and the upcoming modern designs, such as the Leclerc. Skins and camouflages for the AMX-40 from live.warthunder.com. This page was last edited on 29 March 2019, at 16:32.